The Mazda CX-5 has been completely refreshed for the 2017 model year, and shortly after it has received some tech improvements which included cylinder deactivation technology. However, that is not all. 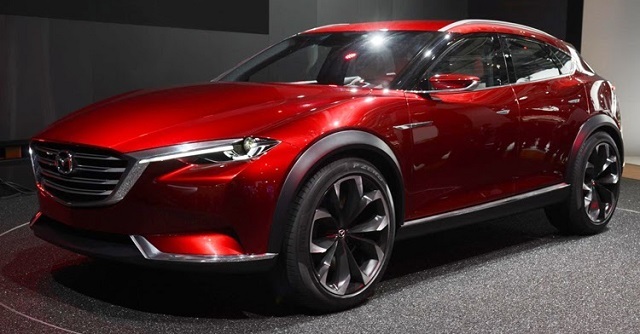 According to the latest rumors, the Company is already planning the all-new 2019 Mazda CX-5. 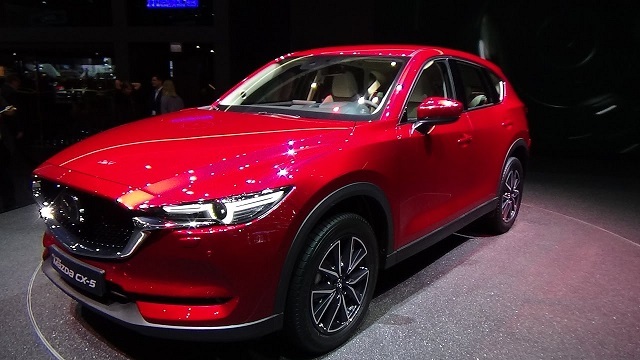 The Mazda CX-5 has always been very popular on the road because of its very handsome exterior styling, practicality and decent fuel efficiency. Besides the attractive exterior, it also offers attractive design and comfortable cabin. However, the cargo space isn’t that ample compared to its main rivals. But, the rear seats can be folded flat so the cargo room increases to 60 cubic feet. Under the hood, the CX-5 is powered with a strong inline-4 unit which is at the same time more fuel efficient in comparison to its key competition. The technology is also on the high level with latest safety features in the offer such as lane departure warning and distance assist and many other more. However, what you might not like is its slow infotainment system and the lack of cargo room. Furthermore, the 2017 model year has arrived with a slightly revised platform which provided lower center on the gravity and therefore more stability on the road. Earlier this month, the carmaker has launched the 2018 CX-5 which offered slightly improved fuel efficiency and more standard equipment; but, generally, it is pretty much unchanged. So, the main question is the upcoming 2019 Mazda CX-5 and expected changes. Unfortunately, there isn’t any official information. However, based on the latest news, the 2019 CX-5 is expected to stay pretty much the same. It should be offered in the same trim levels as before. Those include Sport, Touring and Grand Touring trims. Its main competitors are Toyota RAV4, Ford Escape, Honda CR-V, Subaru Forester and Volkswagen Tiguan. The newest 2019 Mazda CX-5 will most likely arrive with the same engine as its predecessor. This means that it will feature one engine option under its hood. It is a 2.5-liter inline-4 unit. This engine is able to develop up to 187 horses and the torque of 185 pound-feet. It pairs with a 6-speed automatic gearbox only. The front-wheel-drive configuration will be standard as always. However, the all-wheel-drive system will be available as well. Speaking of the fuel economy, with the front-wheel drive it gets 25 mpg in the city, 31 mpg on the highway and 28 mpg combined. With all-wheel drive system, it is rated at 24/30/26 mpg in the city/highway/combined. When it comes to exterior, the CX-5 is a good-looking and very handsome crossover. 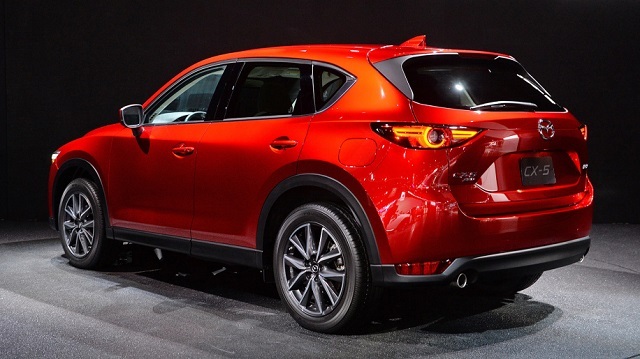 It has already been refreshed in 2017, so the 2019 Mazda CX-5 should arrive unchanged this time. The front end features an attractive design of the grille and a pair of narrow LED headlamps. On the rear, we will notice smaller taillights than on the other crossovers and simple but nicely designed bumper. The base model will ride on the 17-inch alloy wheels while the larger 19-inch alloys will be available on the higher trims. 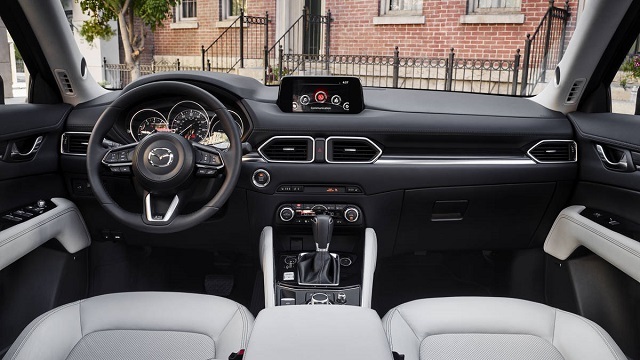 As for the interior, the 2019 Mazda CX-5 will be spacious enough to welcome up to five passengers comfortably. However, its biggest flaw will be crowded cargo space which can be improved with folded rear seats. The seats will be upholstered in cloth while the leather will be available in Touring versions. 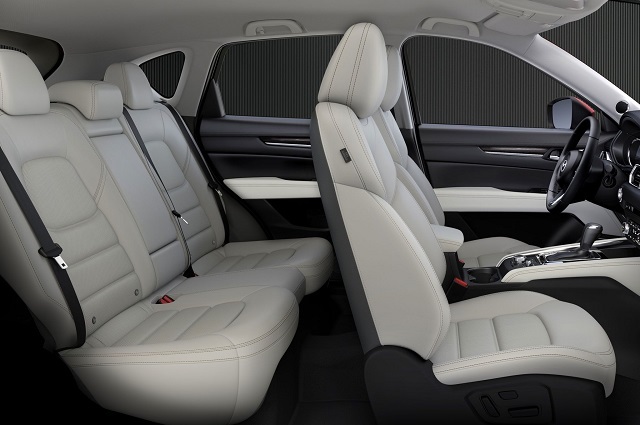 The front seats are very comfortable and supportive; the power-adjustable function will only be standard for the driver and only in the Touring and Grand Touring trims. The dashboard will be very similar to the one in the larger CX-9 model; it will feature a standard 7.0-inch touchscreen with the infotainment system. The base 2019 Mazda CX-5 will arrive with power locks and windows, LED headlamps, blind-spot monitors, rear cross-traffic alerts and leather-wrapped steering wheel as the standard equipment. The Touring version will add keyless ignition, heated front seats, rear-seat vents, an extra USB port, dual-zone climate control, and automatic headlamps. The range-topping Grand Touring will arrive with leather upholstery and a power passenger seat. However with the Grand Touring Premium Package, it will be loaded with a heated steering wheel, heated rear seats and head-up display too. Unfortunately, Apple CarPlay and Android Auto connectivity won’t be available in the CX-5. It is still not revealed when the 2019 Mazda CX-5 appear on the market. As for the pricing, it should be similar to the current model which starts at around $25,000 and goes up to $31,000 for the top trims.